Configuring a layout begins with the assigning of keyboard and mouse inputs (keys, buttons, mouse movements, etc) to the buttons on the controller. You can start by looking up the settings info on the PC version of the game, and try to use the same keys in your MaxAim layout. The second step is adjust the MaxAim DI mouse parameters to achieve a PC like movement between your mouse movement and the in-game reticule movement. Optionally you can also develop a GPC script for advanced customization, one button press macros, automation of commands, event reaction and more. 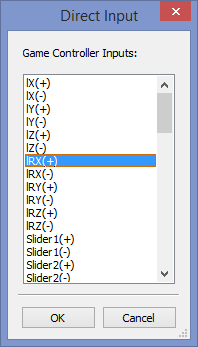 Mapping the keyboard and mouse to a MaxAim layout is easy, as well as binding a Direct Input entry. Just right click on any layout button and pick up an option on the popup menu. The layout can be highly customized, meaning you can link any keyboard, mouse or DI input to any controller entry. For example you can assign a mouse movement up to the motion sensor or to a regular controller button, so when you push your mouse up it will be translated to the CROSS button pressing. The popup menu will not open if the layout editing is locked on the Layout Options menu. • Keystroke: Assign a keyboard key to the selected controller entry. By choosing this item a dialog box will open to read the input key. The MaxAim DI can recognize virtually any key available in your keyboard. International keyboard may show diferent key symbols on the layout buttons. • Mouse Button: Assign a mouse button to the selected controller entry. By choosing this item a dialog box will open to read the mouse button. 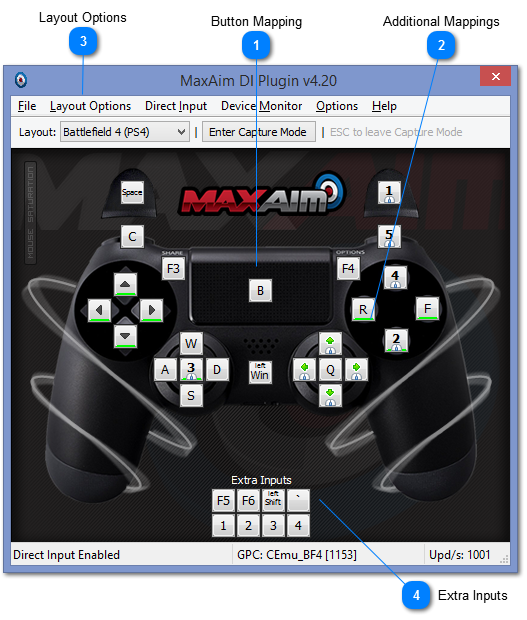 The MaxAim DI supports mouse with up to 5 buttons. 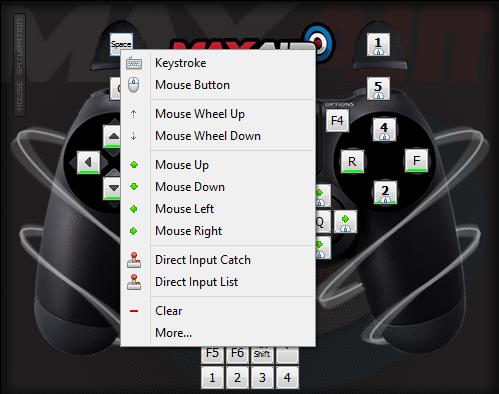 • Mouse Wheel: Assign the mouse wheel up or the mouse wheel down events to the selected controller entry. • Mouse Movement: Assign a mouse movement (up, down, left or right) to the selected controller entry. The mouse movement are usually assigned to the right analog stick, but you can assign this inputs to any button entry. • Direct Input Catch: Bind a DI input to the selected controller entry. By choosing this item a dialog box will open to read the DI input button from the controller. • Direct Input List: Bind a DI input to the selected controller entry. Choose a DI input from a list. • Clear: This option will clean all assignments on the selected controller entry. • More: Assign up to 10 inputs to the selected controller entry, check out the next subject (Additional Mappings) for more details in this regard. By clicking on the [Direct Input Catch], a dialog box will open and wait the user to press a button or an analog direction on the controller. 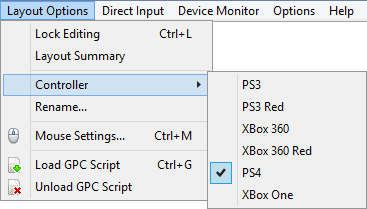 Alternatively, clicking on the [Direct Input List] a dialog window will popup with all available game controller inputs. Select the appropriate input and hit the OK button to save your selection, or click on Cancel button to close the window without any changes. The user can check which inputs are active for the currently connected game controller on the DI Settings window. Each analog input is split in two, by its signal, representing one specific direction (up, down, left, right, forward or back). The meaning of the direction is dependent of the Direct Input entry and of the controller model. The POV members contains the DPad position in degrees clockwise from north. Where 0 means UP, 90 means RIGHT, 180 mean DOWN and 270 means LEFT. Up to 4 DPads are supported, however only the POV1 is commonly found in game controllers. The Buttons are grouped in an array of entries, one for each of 32 buttons. The meaning of each button is dependent of the controller in use. You can check the button actuations on the DI Settings window. The Additional Mappings dialog box allows you to assign up to 10 inputs to a single controller entry. The first one (1) is the main entry and correspond to the one in the main window. The assigning procedure is the same described in the Button Mapping subject. A green line on the bottom of a given button entry indicates that it has multiple assignments. • Lock Editing: Checkable menu item for lock/unlock the layout editing, useful to prevent unintended changes on a finished layout. The lock operation can also be performed through keyboard shortcut (Ctrl+L). • Layout Summary: Opens the Layout Summary dialog window. It shows the layout name, controller type, GPC script information, all buttons assignments and mouse settings. • Controller: Selection menu to choose the background controller image. This setting is just merely visual and has no effect on the layout operation. e.g. You can perfectly use a MaxAim layout with a XBox One controller background on PS3 console. • Rename: Shows a dialog box to rename the active layout. • Mouse Settings: Opens the Mouse Settings window where the mouse parameters can be adjusted through intuitive controls and graphical visualization of transformation curves. The circle test can help to find out the optimal settings for every game. • Load GPC Script: Compiles the GPC script currently active on Gtuner's code editor. If the compilation succeed the bytecode of the script is loaded into the MaxAim layout. The information about the loaded GPC script (bytecode) is shown on the status bar. This menu item is only available in plugin mode. • Unload GPC Script: Unload any GPC Script (bytecode) of the active layou. This option is accessible in both plugin and application modes. In application mode this operation cannot be reversed once it has been done . The extra inputs are available mainly to be used in conjunction with GPC scripts, where you can have, for example, a shortcut key to start a macro or to set some configuration in your script. The first 4 extra inputs correspond to the motion sensors of Dualshock 3 controllers (Accelerometer X, Accelerometer Y, Accelerometer Z and Gyroscope respectively), any assignments to theses entries will be translated to the sensors when using Titan One on PS3 systems. The same is also true for Dualshock 4 and PS4 systems, but all extra inputs are used (Accelerometer X, Accelerometer Y, Accelerometer Z, Gyroscope X, Gyroscope Y, Gyroscope Z, Touch, Touch X, Touch Y). Very few games makes use of the sensors, so you are free to use them for other purposes.